LAKEWOOD, Washington -- A woman in Washington State has shared a heartbreaking apology note left on her door in hopes that she can find the young boy who left it for her. Chrissy Marie posted a photo of the note and a $5 bill that was left with it on her Facebook page Friday. 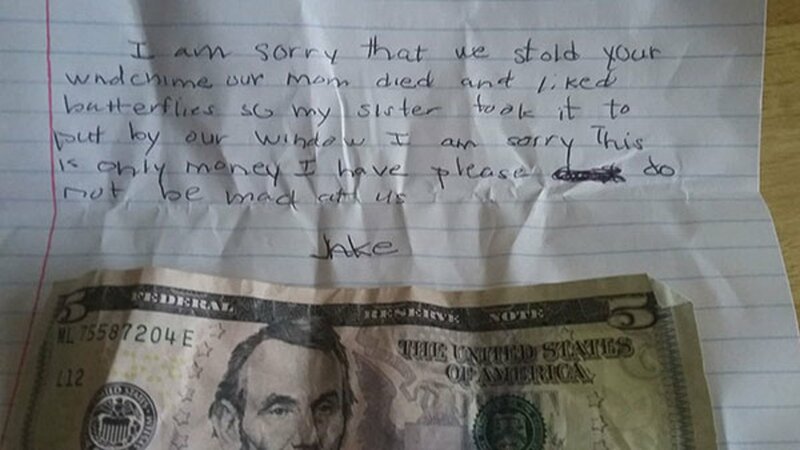 The note reads: "I am sorry that we stold [sic] your windchime our mom died and liked butterflies so my sister took it to put it by our window I am sorry this is only money I have please do not be mad at us. Jake." Chrissy Marie added that she wasn't mad and would like Jake to come back so that she can return his money and give him another wind chime so that he and his sister can each have one. "Well Jake, I not sure who you are but you can come get your money back sweetie. I had 3 of those windchimes," she wrote. In a separate post, Chrissy Marie shared that she lost her own mom when she was only 5 years old. She said if she finds Jake, she will "give him his money without embarrassing or scaring him." You can read her full post below.